Are you sometimes astounded when you are out with another birder who manages to hear and identify many more birds than you? Do you feel like you are missing out on finding lots of species because your eyes are good but your ears aren’t? Don’t stew about, do something! Be prepared for spring migration by giving your ears a real workout and blow your birding buddies away with your amazing abilities come April and May! How? Larkwire! I have been meaning to do a full review of the Larkwire app ever since the folks there were kind enough to give me a free download of the app for just that purpose. Somehow, I never got around to writing the review which is a shame because there is no better way to learn birds’ songs other than actually being in the field surrounded by birds and more capable birders. 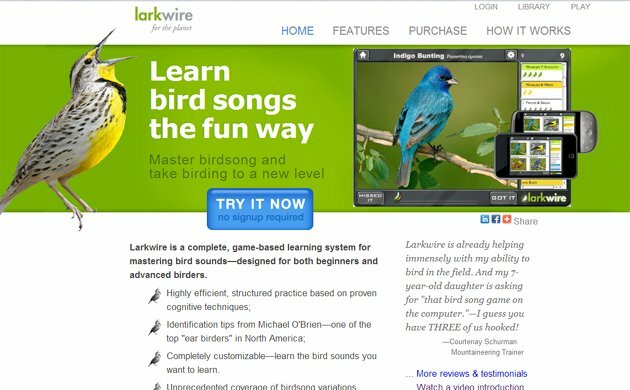 And, of course, if your goal is to learn the birds’ songs before you are out in the field then Larkwire is absolutely the best way to go. Maybe it is for the better that I waited until the depths of northern winter to finally get something written about Larkwire. This will give North American birders, the birders that Larkwire is meant for, plenty to do in the remaining time before the breeding birds come back. How does Larkwire work? It is two different games that you can play on your desktop, laptop, smart phone, or tablet. (If you load it onto an iPhone, iPad, or iPod Touch you don’t need an internet connection to use it but if you use an Android device you’ll need to have a connection.) You can play the games any time with whatever time you have available. If you only have ten minutes between meetings you simply stop playing when your meeting starts and start playing again exactly where you left off the next time you have a chance to play. The “Gallery Game” gives you groups of birds with similar songs. One of those songs plays and you guess which bird it is. If you’re wrong the game lets you know what bird actually sings the song you heard. Once you have mastered the “Gallery Game” you move on to the “Field Game” where a song plays, you indicate if you know it or not and then you see if you were right. If you had it right, great! If not, you indicate that you actually had it wrong, and you will continue to be quizzed on it until you learn it. You can also customize the games to quiz you on birds that you know give you trouble, for the habitat you know you will be birding, for the geographic area you will be in, or any way you want. Larkwire is a simple, easy-to-learn, ingenious app that will have you identifying birds by ear in no time! Why not give Larkwire a try? You can check out a free demo version on their website. Identifying birds by hearing is definitely a hard thing to learn to do, but when you can, it adds an entirely new dimension to birding. I am not the best at IDing birds by sound, but as I practice more and more it makes birding more engaging and enjoyable. What a great idea! I think learning sounds in the field is the most comprehensive means of getting a handle on bird vocalizations but this sounds like an excellent learning tool.